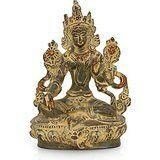 Tara or Arya Tara, also known as Jetsun D lma in Tibetan Buddhism, is a female Bodhisattva in Mahayana Buddhism who appears as a female Buddha in Vajrayana Buddhism. She is known as the "mother of liberation", and represents the virtues of success in work and achievements. Tara is actually the generic name for a set of Buddhas or bodhisattvas of similar aspect. These may more properly be understood as different aspects of the same quality, as bodhisattvas are often considered metaphors for Buddhist virtues. Size : 6 Inches Height X 4.5 Inches wide X 2 Inches depth. Weight : 0.750 Kg. Material : Brass., antique dust finish -------------- Pls beware from Copy product & ensure buying authentic product. This is exclusive inhouse design & product of Brand "Collectible India" and "covered by intellectual property rights laws". 'Collectible India' doesn t authorize any other Brand/Seller to sell it and we won't be responsible if any counterfeit or substandard product send by any other seller.